Michigan is very familiar with the process of creating a single brand to promote a critical issue impacting the state economy. In 2008, the Pure Michigan® brand was created to market Michigan as a travel and tourism destination. Millions of people throughout the country have seen the Pure Michigan® campaign on their televisions or heard it on the radio. The melodic sound of Tim Allen’s voice sincerely guides viewers and listeners through scenes of what can only be described as, you guessed it, pure Michigan! Through years of investment, Pure Michigan® became not just a series of ads and commercials, but also a valuable resource for those seeking information on where to travel and recreate. The Pure Michigan® website was developed to provide detailed information on how to enjoy the greatest of the Great Lakes states. Visitors to Michigan.org can find things to do, places to stay, events, trip ideas and explore the Mitten State from the comfort of their computer or phone. As the brand gained success, Pure Michigan® was placed front and center by the Michigan Economic Development Corporation in effort to attract businesses to Michigan as seen in one of the MEDC’s recent business promotion videos. Uniting the state under one brand has helped grow Michigan’s economy. The Michigan Construction campaign is following the path blazed so brilliantly by Pure Michigan®. Starting with the goal to unite the entire construction industry, Michigan Construction looks to grow the best and brightest pool of construction talent. As the infographic above shows, Michigan Construction is off to a great start! 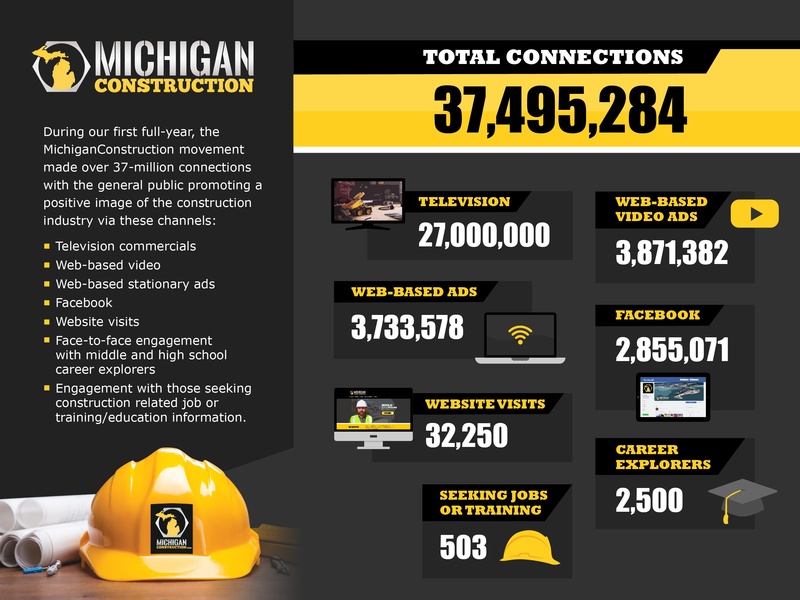 The Michigan Construction brand has been seen over 37-million times by people all across our state on their TV, computer or phone screens. The majority of these connections came from a series of three commercials: The Road Begins, The Road and Gamers, that all tell a sincere story about construction. These well-crafted commercials inspired over 32,000 visitors to MichiganConstruction.com. Over 500 of those engaged with Michigan Construction by filling out forms seeking job, education or training information.